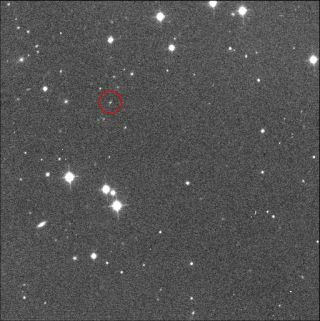 An image of the asteroid 2010 SO16 taken by astronomers using the Faulkes Telescope North. The asteroid has an odd horseshoe-shaped orbit and has been trailing Earth for nearly 250,000 years, astronomers say. A newfound asteroid has been discovered to be trailing Earth on an oddball course: an orbit that looks a lot like a horseshoe. "Its average distance from the sun is identical to that of the Earth, but what really impressed me at the time was how Earth-like its orbit was," said Apostolos Christou, an astronomer at the Armagh Observatory in the United Kingdom, who led the study that pinned down the asteroid's orbit. Asteroid 2010 SO16 and the Earth follow similar orbits around the Sun. But as seen from Earth, 2010 SO16 gradually traces out a horseshoe shape in space, taking 175 years to go from one end of the horseshoe to the other. In this diagram, with the Sun [S] at the center, the asteroid [diamond] approaches Earth [E] and then recedes from it. Currently, the asteroid is at a point in its orbit that brings it near the horseshoe's tip that trails the Earth. But despite its apparent attachment to Earth's orbit, the asteroid poses no risk of smacking our planet. "This asteroid is terraphobic," Christou said. "It keeps well away from the Earth. So well, in fact, that it has likely been in this orbit for several hundred thousand years, never coming closer to our planet than 50 times the distance to the moon." The average distance between the Earth and the moon is about 238,000 miles (382,900 kilometers). The researchers used WISE observatory's data as a starting point to determine the asteroid's orbital path, and used computer simulations to sift through every possible orbit it could have. All of the simulations predicted the odd horseshoe-shaped path. The research is detailed in the Monthly Notices of the Royal Astronomical Society. One such space rock is the asteroid Cruithne, a 3-mile-wide (5 km) object that takes about 770 years to complete its horseshoe orbit. Cruithne was discovered by astronomers in 1986, but it wasn't until 1997 that scientists pinned down its weird orbit, which should keep the asteroid in a holding pattern near Earth for at least 5,000 years. Christou and Asher said their next step is to identify where asteroid 2010 SO16 came from. And their choices are many. The space rock could have been ejected from the solar system's main asteroid belt between the orbits of Mars and Jupiter, or may be a wayward member of a group of asteroids that may lurk at stable gravitational spots ahead of and behind the Earth, the researchers said. It could also be a chunk of Earth's moon kicked up during an ancient impact, a leftover remnant from the formation of the solar system 4.5 billion years ago, they added. Christou and Asher are conducting follow-up observations with the Las Cumbres Observatory's Faulkes Telescope to learn more about its characteristics. "It is not that difficult to spot with a medium-sized professional telescope," Asher explained. "It will remain as an evening object in Earth's skies for many years to come."